Though fax machines were invented to send documents quickly and securely, it is no longer the fastest form of delivery. A fax takes about a minute for each page to be transmitted to its destination on a phone line while alternative technology that sends information digitally is sent instantly to the recipient. Additionally, there are a surprisingly large number of fax machines in healthcare that still use costly ink and paper – resulting in both the slowest and most expensive delivery option in the industry. In an effort to be more efficient and reduce costs, CMS administrator Seema Verma set a goal for the healthcare industry to be fax-free by 2020. Vyne Medical heard this challenge and set forth with an initiative to accelerate fax elimination. As healthcare begins to evolve away from the fax machine, it is important to look back on how it came to life. To evolve, we must learn from its history and understand how we can improve upon it, satisfying the need fax machines have served for decades. 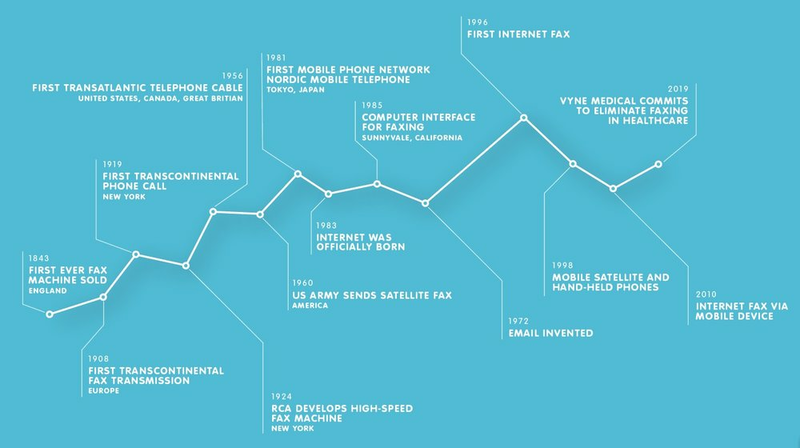 Surprisingly, the first fax machine was invented prior to the telephone. While the telephone was invented in 1876, the first version of a fax machine was developed in 1843. In time, these two technologies evolved and eventually merged together. As a refresher (and for those of you not born before 1990): a fax machine delivers exact copies of documents through phone lines to another location. Modern faxes, or eFaxes, scan documents and use the internet to deliver documents from one location to another be it an email address or another fax machine. In 1964, the fax machine and telephone merged to create the modern-day fax machine where documents are sent over telephone lines. This technology evolved very little until 1996, when faxes could be sent using the internet. It gained popularity being a fast, secure way of delivering important documents particularly in business, legal, healthcare, government and other industries. As communication has evolved—thanks to the internet—with email and social media, many industries have abandoned fax machines, particularly ones with less regulation regarding confidentiality. Healthcare and legal industries still rely heavily on the fax machine as the most secure way to transmit important information from one location to another, even though it is no longer the most cost-saving, efficient form of communication. As costs rise in healthcare, providers are looking for solutions that will positively impact their bottom line by increasing productivity and improving workflow efficiencies. This is forcing the healthcare industry to enter the modern world of technology beyond just EHR systems with tools to support daily processes while eliminating old technology such as the fax machine. Vyne Medical has already begun the process of eliminating fax machines in several health systems with tools that capture disparate data (i.e., patient scheduling, insurance and financial information) and automatically index it to the patient record for enterprise access and exchange. This eliminates paper processes and automates manual tasks such as faxing medical documentation, moving records between systems and linking documents to the patient chart. In other industries, fax machines were phased out over time as the internet and digital world grew. The healthcare industry can take on a similar approach and gradually move away from the fax machine with help from the right digital tools. While implementing necessary technology and establishing new workflows, hospitals can begin to send and receive patient information electronically and securely even fax machines have been eliminated in the rest of the healthcare market. This will allow for no disruption while entering the modern world. Is your health system ready to Eliminate Fax Machines? For more information on how Vyne Medical can eliminate fax machines in your health system, contact us at info@vynemedical.com or fill out the form.